San Diego Wannabes | Fans since 1995, we believe in the direction of the team, our unique and beautiful ballpark, and the best place on earth to visit…San Diego. We dream of living there one day. Fans since 1995, we believe in the direction of the team, our unique and beautiful ballpark, and the best place on earth to visit…San Diego. We dream of living there one day. We’re Back and still loving our Padres and Chargers!!! It’s been a long time since we have updated this blog, but the new ownership has energized us. Although the Padres our out of the race, unless we don’t lose again this season, they won their 8th game in a row last night. But the good news is enormous. Top prospect Casey Kelly made his MLB debut and pitched well. He showed a lot of poise and athleticism. If he stays healthy he will be a top three starter. I am very excited about our future. And the Dodgers blockbuster trade made me confident we can compete with them. Their lineup is great, but their pitching is a disaster. Its Kershaw and ….and…. They gave up their top two pitching prospects in the deal and will now have to pay many more millions this winter to try to get some starters. Dempster and Grienke won’t make the difference they’ll need to win the division. 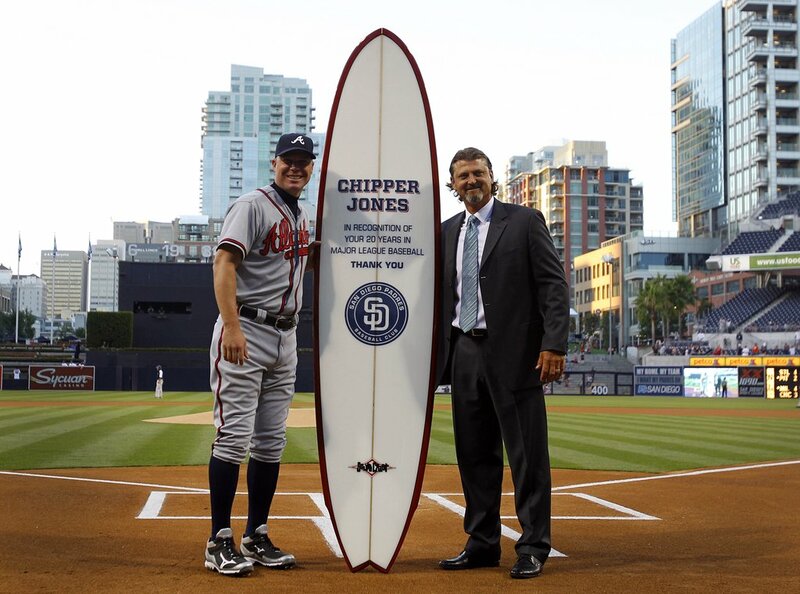 It was cool to see the pre-game ceremony for Chipper Jones. He seemed genuinely happy to get the surf board and have Trevor present him with it. Have a great retirement Chipper. My Padres began their long winning streak last night with an exciting 6-4 win over the Reds. Edgar Gonzalez has finally gotten his chance and has made the utmost of it. He is red hot now pushing his average to .321 and making a very strong case to be the incumbant 2nd baseman in 2009. The other Gonzalez, Adrian, has had a terrific year at both the plate and at 1st base. He has put himself in the upper tier of all-around players in the NL. Brian Giles is my current hero. He proved to everyone that he indeed is the team leader in St. Louis on Saturday when he made a great catch before running into the wall in the RF corner at full speed. He risked his future career to try and catch a fly ball during the most difficult season My Pads have had in awhile. I hope he is with us in 2009. The only hitter hotter than E-Gon is Scott Hairston who hit yet another HR last night. He keeps pulling even outside pitches, but the results of late have been spectacular. Back from the break. Not much has changed as My Padres lost to the Cardinals 4-3. All the runs St. Louis scored came on HR’s off of Jake Peavy. The offense was led by the Gonzalez brothers, Edgar and All-Star Adrian, Kevin Kouzmanoff, and Peavy who all had two hits each. But the big hit failed us when needed. The Atlanta Braves whooped up on My Padres again yesterday, this time by the score of 12-3. It was a night of glorious memories of the 1998 Padres. Many thanks to channel 4 in San Diego for showing most of the ceremony which we watched on Directv’s Extra Innings. My wife and I laughed, cheered, and cried throughout the ceremony, interviews, and highlights that were shown during the game. We were very happy with the good reception Kevin Brown received from the Padres Faithful. Tony Gwynn got a rousing ovation, but Trevor Hoffman’s seemed somewhat subdued in comparison. Maybe it just seemed that way on TV. Trevor had 53 saves in 54 oppurtunities in 1998…simply amazing! All the players seemed to really enjoy the gathering and we just love Greg Vaughn. It sounds like his son might be pretty good. Of course, for us, the moment when Kevin Towers carried out Caminiti’s jersey was a moment of tearful emotion. RIP Ken. The game? The offense let another decent start for Greg Maddux go for naught…not every year can be like 1998. My 1998 Padres began Spring Training with a different outlook than ever before~~they expected to win the World Series. The front office had aquired a legitimate #1 Ace, Kevin Brown, in the offseason which added to a very strong club across the board. It was a fantastic group of guys who combined to win 98 games in the regular season. As I wrote in the first post, I went to school and played baseball for a couple of years with Ken Caminiti while living in San Jose. I moved back to Utah early in my sophomore year of high school and never contacted him again, but I followed his career very closely. When he was traded to the Padres in 1995 is when my wife and I first fell in love with the city and county of San Diego. We even purchased season tickets (a partial plan) for 1996, 1997, and 1998. We made several trips each year back then (we soon found out that you actually have to pay credit cards back). Our seats were on the loge level between home and 3rd base. It was a great place to watch the game from and gave us a great view into the Padres dugout. Our usual routine for game days were to drive down to the beach and take a morning walk, have a light breakfast and lunch, arrive early at the Q and eat a heavy, delicious dinner at Randy Jones’ BBQ. Those were wonderful days and nights in Mission Valley. We attended Game 3 of the NL Championship Series and Game 3 of the World Series and will never forget the incredible electricity within the stadium. I can’t even describe the feverish pitch the crowd created as the music blared just before the team took the field. Unreal. The Padres faced the Houston Astros in the first round of the playoffs. Randy Johnson had been recently aquired by the Astros which already included the offense of Jeff Bagwell and Craig Biggio. Although the Friars had won an astounding 98 games, they only had the 3rd best record in the NL in 1998. Houston had won 102 games and the Atlanta Braves registered 106 victories while in the middle of their amazing run. Game 1 was the biggest game of the series as Kevin Brown outpitched Randy Johnson as he struck out 16 Houston hitters in 8 innings and the Padres stunned the Astros 2-1. Brown’s 16 K’s were the 2nd most in playoff history to Bob Gibson’s 17 in the 1968 World Series. Houston won Game 2 to even the series, but more than 65,000 fans welcomed the Swinging Friars home. 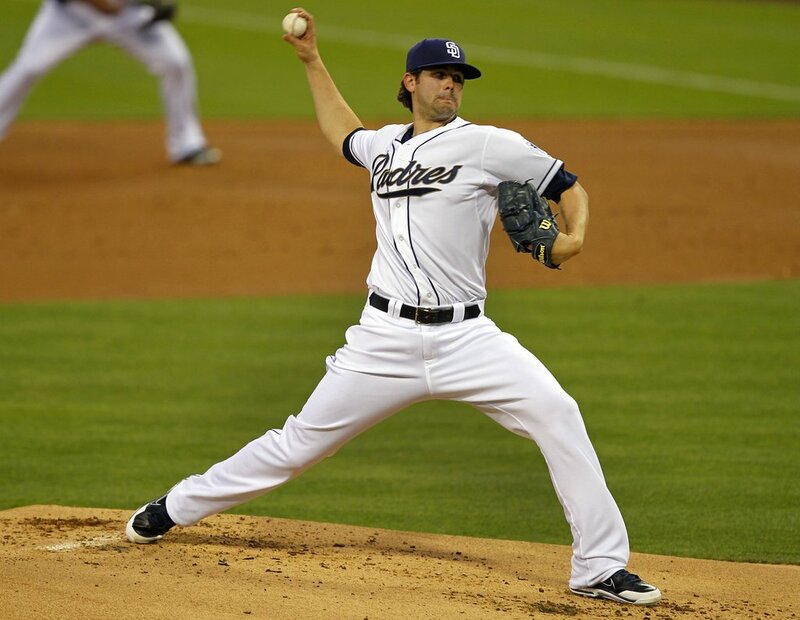 Kevin Brown went 6.2 innings on just 3 days rest as the Padres won again by the score of 2-1. Trevor struck out the side to secure the win. Sterling Hitchcock closed out the Astros in Game 4 as he whiffed 11 in 6 innings and Jim Leyritz hit his 3rd HR of the short series in the 6-1 clincher. In the NLCS the Braves were the next victim. Ken Caminiti hit a HR in the top of the 10th inning in Game 1 to lead the Padres to the 3-2 victory. San Diego went on to win the next two games to take a commanding 3-0 series lead. Kevin Brown threw a complete game 3-0 shutout in Game 2. But the Braves won Games 4 & 5 in San Diego to scare the dickens out of us as they traveled back to Atlanta for Game 6. My Padres finally finished off the series with a comfortable 5-0 win and a NL Championship celebration that I will never forget watching on TV. It was the most fun I have ever had as a sports fan. The World Series was still a lot of fun even though we lost. It was an incredible experience to attend a World Series game and something I didn’t even dream I would do as I grew up in a small town in Utah. Jake Peavy pitched 7 shutout innings while giving up only 4 hits as he led My Padres to a 4-0 win over the Atlanta Braves. The bullpen finished off the shutout. The offense was led by four players who each had 2 hits: the red-hot Scott Hairston, the Gonzalez brothers-Adrian and Edgar, and Chase Headley.